Acknowledged author Robert Hamilton wrote The Law of Business Organizations, Cases, Materials, and Problems (American Casebook Series) comprising 1111 pages back in 2017. Textbook and etextbook are published under ISBN 1634608135 and 9781634608138. 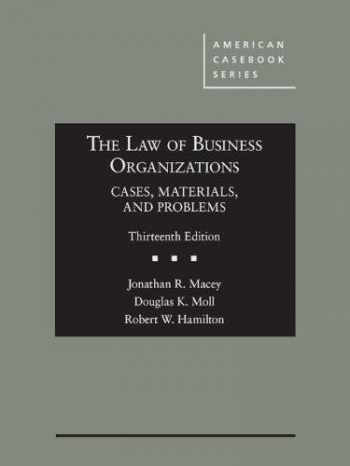 Since then The Law of Business Organizations, Cases, Materials, and Problems (American Casebook Series) textbook received total rating of 4 stars and was available to sell back to BooksRun online for the top buyback price of $82.59 or rent at the marketplace. This title covers the law of business associations for introductory courses, including agency, general partnerships, closely held corporations, publicly held corporations, limited partnerships, limited liability partnerships, and limited liability companies. The material on the unincorporated business forms has been revised, updated, and expanded to reflect the centrality of these forms of business organization in modern law practice and the economy generally. Among other state and model statutes, the Uniform LLC Act (2013), the Uniform Partnership Act (2013), the Uniform Limited Partnership Act (2013), the Third Restatement of Agency (2006), and the Model Business Corporation Act (2016) are discussed and cited.